No one makes the conscious decision to be a bad parent, however, plenty of people are regardless. 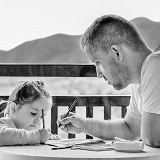 When you set clear rules for your child, and discipline them appropriately, you prepare them for the world and help ensure they grow up into secure, calm, rational adults. Follow the above four steps and your child will thrive in this world. Having too many rules will only lead to frustration for both you and your children. Examples of some rules you could have are no biting, kicking, or hitting except in self-defense, no bullying, eat in a civilized and thankful manner, learn to share, go to sleep properly, take care of your belongings, be good company, etc. Enforce these rules strictly but with the least force necessary. The amount of force you need to enforce your rules will differ from child to child, so you’ll have to determine it experimentally. Some children require nothing more than a glare, whereas others require a verbal command. Both the mother and father should put in an equal amount of effort when it comes to parenting children. Understand your capacity to be harsh, vengeful, arrogant, resentful, angry, and deceitful. Then, plan a proper disciplinary strategy for when your child evokes such emotions in you. Otherwise, you run the risk of these negative emotions turning into genuine hatred for your child.